The Women’s Bean Project is where a woman earns her future – for herself, her family, her community and our economy. 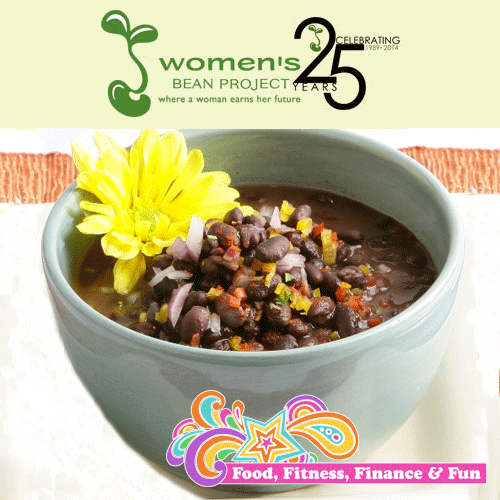 Products made by Women’s Bean Project over the last 25 years include handcrafted, limited-edition jewelry and gourmet food items for bean soup, chili, cookies and brownies, corn bread, dips, mixes, salsas, gluten-free items, and more. Products are sold through their website, as well as through various online retailers and stores across the United States. My mom and I have been buying the Chili and Bean Soups from The Women’s Bean Project for the past 20 years. My mom gave me the 6 Bean Soup as a Christmas gift this year, so I decided to crockpot it as soon as I was back in the RV. Picked up the ingredients last time I was shopping so shopping didn’t take any extra time since it’s so simple. 12:00 pm Friday: Cut the onion and garlic, opened the can of tomatoes, and put everything in the crockpot WHILE the beans were in the micro. 3:15 pm: Stirred it up and turned it down to LOW…smells DELISH in here! 5:00 pm: Tasted it and beans were still hard-ish. Want to have it for dinner so turned back up to HIGH. 7:00 pm: Too lazy to make the Quinoa I bought for it, so I broke open the crackers ($4.00) and we enjoyed our soup with crackers this time. I give it an 8 out of 10…only because beans make se feel heavy so they are never my first choice. After we ate it, I turned the crockpot to low, added a bit more water, and went to bed. If you have read my past crockpot meals, you know I eat more than an average person, but even so, our soup lasted us 3 meals each. On Friday I ate 3 c and Rick ate 2 c, Saturday we each had 2 c for lunch and 1 c for dinner. I did end up buying Rick saltines which added $2.50. This crockpot made a total of 11 cups of soup…WOWZERS!!! Total cost was $15.50 which comes to $1.41 a cup (which is probably a normal serving once you added the crackers or quinoa). Total time to make: 15 minutes work, 24 hours sitting in the pot. Sounds like a success story to me! 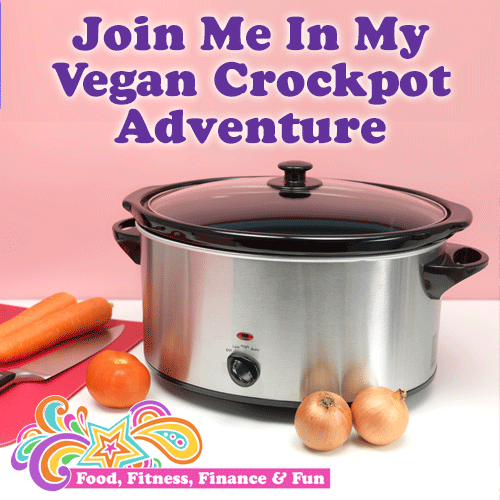 Why would I turn to crockpot vegan cooking? Let me count the ways. I was listening to the Dave Ramsey podcast today during my run…as I do every day…and had an epiphany! Yay!! Where we always get off track on our budget is food. Both eating out and buying convenient meals from the grocery store. So when he was talking to someone about beans and rice today, it hit me! I need to jump on the beans and rice bandwagon. Sounds like a win-win-win-win-win-win-win-win-win-win (yes that is 10 wins) situation to me!! So I am committing to at least one crock pot/beans and rice type meal a week for the next 10 weeks. If you have some good, inexpensive, easy, and vegan (or can easily become vegan) recipes, I would LOVE for you to post them. I’ll be sharing mine each week with ingredients, prep time, coat, and taste results from both me AND my hubby (he naturally gravitates toward chocolate, coffee, and Pepsi ) so most people will probable lean toward his review of the meal.